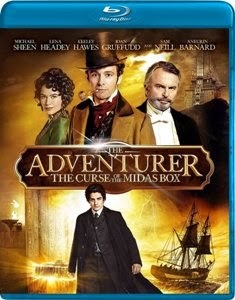 The title is a mouthful that doesn’t exactly roll off the tongue: The Adventurer: The Curse of the Midas Box. New on Blu-ray from RLJ/Image Entertainment, this family-friendly adventure attempts to establish a new franchise, a cross between Indiana Jones and Harry Potter. It’s based on a young adult novel series by G.P. Taylor centering on a character named Mariah Mundi. The Adventurer presents an overly complicated plot, but strong production values help make it watchable. Pre-teens might get a kick out of it – that’s the demographic at which it’s squarely aimed. Set in England during the Victorian Age, The Adventurer is high on atmosphere but low on thrills. Most of the cast will be unfamiliar to U.S. audiences. 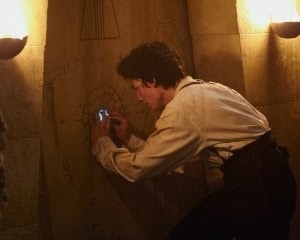 Aneurin Barnard stars as Mariah Mundi, a young man suddenly thrust into a frantic search for the Midas Box. Any object put in the box will turn to gold. In short order, Mariah discovers that his parents are members of the Bureau of Antiquities – an organization that keeps track of magical artifacts. His mother, Catherine (Keeley Hawes), slips one half of an amulet to him and other to his brother, Felix (Xavier Atkins). Without both halves, there’s no way to open the box. When Felix is nabbed, Mariah meets the colorful Captain Will Charity (Michael Sheen), also a member of the Bureau and an associate of Mariah’s father, Charles Mundi (Ioan Gruffudd). Jurassic Park’s Sam Neill provides a bit of marquee value as the villainous Otto Luger, a man who wants to obtain the Midas Box and control the global economy. Between Mariah, his sidekick Sacha (Mella Carron), and Captain Charity, the quest for the box should’ve been a light action romp. Instead, things just never catch fire. Most of the movie plays out with a bland evenness that doesn’t goose the pulse enough to be interesting. RLJ/Image’s Blu-ray is faultless, with a terrific high definition transfer that effectively presents the dark, heavily-shadowed look of The Adventurer. Much of the detail is intentionally swallowed up by atmospheric low lighting, but the golden-hued faces and ornate period costumes look great. There’s a DTS-HD Master Audio 5.1 surround mix that works well, too. Though reportedly made for $25 million (relatively low for the genre), it looks and sounds like a much more expensive production. “The Making of The Adventurer” is a 20-minute promo piece in which the filmmakers make their ambitions clear. In light of the Harry Potter film series having wrapped up, they hoped to kick off a similarly adventurous, supernatural-themed franchise based on young adult literature. The results are limp – well-produced, but bland.